Brunda Sahu, a farmer in Odisha’s Bargarh district, set his paddy field on fire on Tuesday after he was frustrated with the alleged cold response of the district administration to the crop damaged by pests. A day later, he went to the same field in Kalapani village in the district early in the morning and consumed poison. He was taken to the hospital but soon died while undergoing treatment. His family said Sahu had taken a loan of around Rs 500,000 to cultivate an area of 15 acres. Sahu is not the only farmer who has ended his life this season due to damaged crops and alleged debt burden; he is the fourth one, that too within a span of 15 days. The fresh reports of suicides by the farmers in quick succession have again brought into focus the acute farm distress in the district, known as the ‘Rice Bowl of Odisha’. Three days ago, another farmer, Akshay Dharei (58) of Tora village, killed himself by consuming pesticide after he found his paddy crop, cultivated in nine acres of land, damaged due to pest attack. “My father had taken an agricultural loan of Rs 200,00, besides a loan for a power tiller. 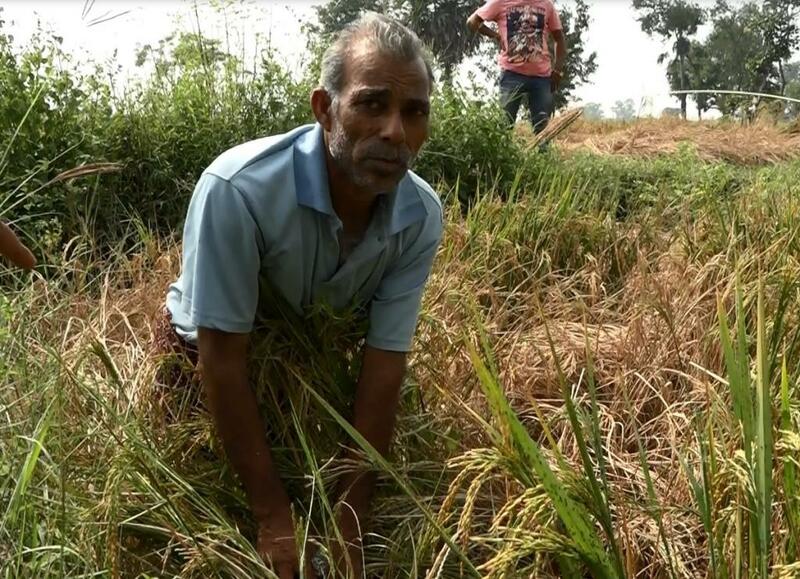 He became depressed after the crop was damaged after being affected by ‘chakada’ (brown plant hopper),” says Subash Dharei, the deceased farmer’s son. After Sahu’s death on Wednesday, Odisha agriculture minister Damodar Rout held a meeting of top officials in Bhubaneswar and sent a technical team to visit Bargarh to assess the reason of crop damage in farmers’ land. He also asked the district administration to submit a report on the death within 48 hours. An expert team from Odisha University of Agriculture Technology will go to Bargarh to study the pests and pesticides used in the fields as the government had asked the agriculture officials three months back to procure pesticides to combat possible pest attacks. After the crop damage, it would be assessed if the pesticides were fit for the kind of pests damaging the crop, an official said. Already, Odisha’s farmers are under stress due to drought this year. The Odisha government has declared severe to moderate drought in 5,958 villages under 1,097 gram panchayats of 70 blocks of 15 districts depending on the inadequacy of the rainfall this year and percentage of damage in sown areas: above 50 per cent, between 50 per cent and 33 per cent, and up to 33 per cent. Balangir has been ranked as the most affected district with crop damage in 1,709 villages. It is followed by Bargarh with 925, Dhenkanal with 715 and Boudh with 646 affected villages. The collectors of the 15 villages have been asked by the state government to take up relief measures in their respective districts. Suicides by farmers are not new in Odisha, though it reports fewer such incidents than states like Maharashtra and Telangana. But in the recent years, the number of suicide is on the rise. Official figures say that between 2001 and 2010, over 2,600 farmers committed suicide in Odisha. During the drought in 2015, at least 138 farmers committed suicide in the state, out of which Bargarh alone accounted for over 40 deaths. Being a beneficiary of Hirakud Dam irrigation system has not helped Bargarh much because of high investment in paddy cultivation in the recent years. Family members of the deceased farmers and social activists keep alleging that the farmers commit suicide basically due to crop loss and loan burden but the government rules out such possibilities. In 2015, the collectors’ reports on farmers’ suicides attributed “family dispute”, “marital discord” and “consumption of liquor” by the farmers as the possible reasons for the suicides. Nevertheless, under fire from opposition, chief minister Naveen Patnaik had announced a package of Rs 1,000 crore for providing subsidies for agricultural inputs, fresh loans and tuition fee waivers for students in drought-hit areas. Over 75 per cent of people in Odisha depend on agriculture of which over 85 per cent are small and marginal farmers, having less than two acres of land. The agriculture is mostly paddy-centric, which has been reflected in Odisha becoming the third biggest contributor to the national rice pool in the recent years. Several studies have revealed that the farmers in Odisha, earning about Rs 5,000 per month, are consistently under pressure and take loan from banks, self-help groups and private money lenders. For marginal farmers, it is difficult to get loan from nationalised banks, so they turn to private money lenders who charge between 2 per cent and 10 per cent interest per month. Under such circumstances, a drought year breaks their economic backbone.